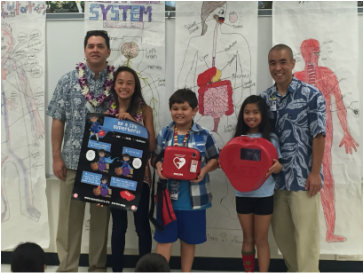 Malia presented Kamiloiki Elementary School with the very first Heart Start AED donation. At age 11, Malia Benn heard about a teacher at her school collapsing after playing basketball. He went into cardiac arrest and his heart stopped beating. Thankfully, he was brought back to life with the use of an Automated External Defibrillator (AED) that was readily available on campus. 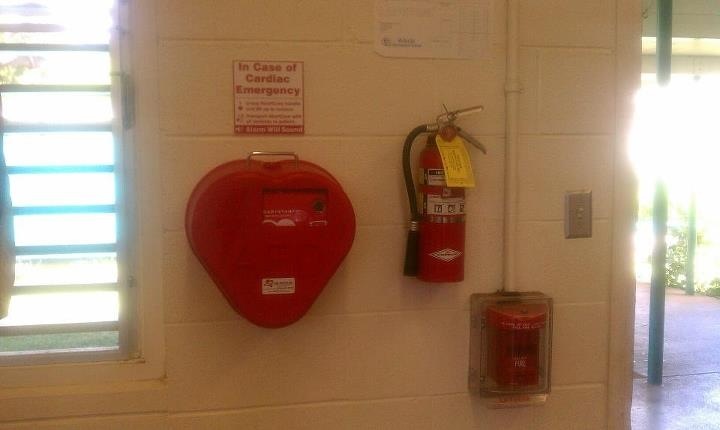 Malia discovered that most schools in Hawaii do not have AEDs. This inspired her to start the HeartStart Hawaii Foundation to ensure that every Hawaii school has AEDs and CPR training in hopes that countless lives can be saved. It is estimated that 20% of Hawaii’s population is on a school campus each day. By arming our schools with these lifesaving skills and equipment, we will increase our odds of making a real impact in our community. Your school can apply to become a recipient of a free AED. We need your support to continue donating AEDs throughout Hawaii. Your donation will help save lives! Our mission is to save lives throughout Hawaii by ensuring every school has an AED.